Across the country, many areas of the tourism industry such as hotels and amusement parks are struggling to stay afloat. But…the RV park segment is an exception — it is on the gradual increase year after year. After the events of 9/11, consumers became weary of flight travel and thus turned to the good old-fashioned RV. According to the Recreational Vehicle Industry Association (RIVA), RV travel and sales have recently reached record levels. Currently, there are 7.2 million RVs on the roads in the United States alone. They are owned by over 7 million households. Add to that the nearly 30 million RV enthusiasts, renters and owners, and the RV industry (sales of RV’s and rentals) is estimated to rise 15 percent during the 2001-2010 time period. Recreational vehicle parks and campsites are frequented by a broad spectrum of the population including middle-aged or senior citizen couples often on prolonged trips and with wide-ranging travel itineraries. Add families with young children and young couples and it is easy to understand why establishments may cater exclusively to such demographic groups. Demographic studies have found that RVs were increasingly appealing to younger consumers. Although Americans aged 55 and older owned approximately one-third of the total RVs on the road in the late 1990s, the segment experiencing the most growth in the industry was baby boomers. RV ownership by Americans aged 45 to 54 increased 25 percent in the mid 1990s. By the end of the decade, approximately 45 percent of the nation’s RVs were owned by Boomers between the ages of 35 and 54. Compare this to the 40 percent owned by those aged 55 and older. The average age of the RV owner is reported as 48 years old with a median income of $56,000. The study also found that nearly 25 percent of Boomers intended to purchase an RV sometime in the future. This begins to support the observation that RV travelers are seeking the “comforts of home” even on the road. Gone are the days when having a phone connection at RV parks and campgrounds were a campers’ top request. It has become less significant because high-speed Internet access, (usually via a WiFi system) offers faster and greater convenience. A WiFi system is a portal that RV parks can purchase to provide wireless Internet reception for many computer users within a certain distance. A majority of “upscale” RV parks are now offering this service free of charge as competition in the industry increases. RV parks are making more changes to accommodate or appeal to more than just the hi-tech campers. Campers will also find 24-hour security, online reservations and interactive websites, landscaping and general appearance enhancements, and recreational facilities such as game rooms, gyms, and spas. 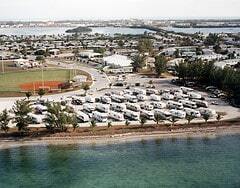 RV parks do need to watch for potential problems when developing their amenities. They first need to determine a key target market in order determine and assess the proper amenities that this market would demand. Consider a playground for young families or maybe a library to let the older crowd relax. Every RV park is going to be unique to its location so there in no clear layout for a perfect RV park. There is however a difference between the size of the park and the number of spaces that it offers. Parks designed with the RV traveler in mind will vary space sizing from small sites with narrow roads to larger spaces with larger roads and a greater distance between each unit. The difference in these sites will be reflected in the daily or weekly rates charged. Different estimates have shown that the average cost of building each space ranges from $15,000 to $20,000. Most new and existing parks have at least 150 spaces available to travelers. “So, you want to build an RV park!” by Tom Gonser. RVers Online, June 2004. Accessed online November 8, 2004. “Recreational Vehicle Parks and Campsites,” by Rebecca Marlow-Ferguson, Encyclopedia of American Industries, Gale, 2011.